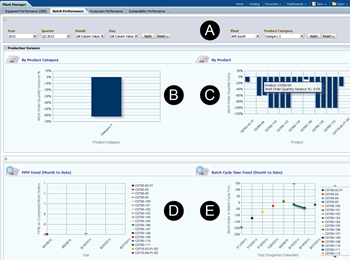 This dashboard provides analytics tools for work orders executed within a selected period in all or single plants and product categories (A). The graph (B) on the left side below the selection area shows the percentage distribution of work order quantity variance for a whole category. Left to it the results for produced items (C) in the category are output. The diagrams in the lower area show the parts per million (PPM) trend (D) and the batch cycle time trend (E) for work orders in this category. Clicking on one of the bars in the products section (B) opens the batch performance detail report which outputs a table (G) with particulars for executed work orders related to the product chosen in the selection area (F). In addition to period, plant, category and product output can be limited to only show work orders with a specific status like cancelled or complete. Table (G) contains work order number, product, primary unit of measure (UOM), planned start and end date, planned cycle time actual start and end date, actual cycle time, planned and actual completion quantity, work order quantity variance and status.